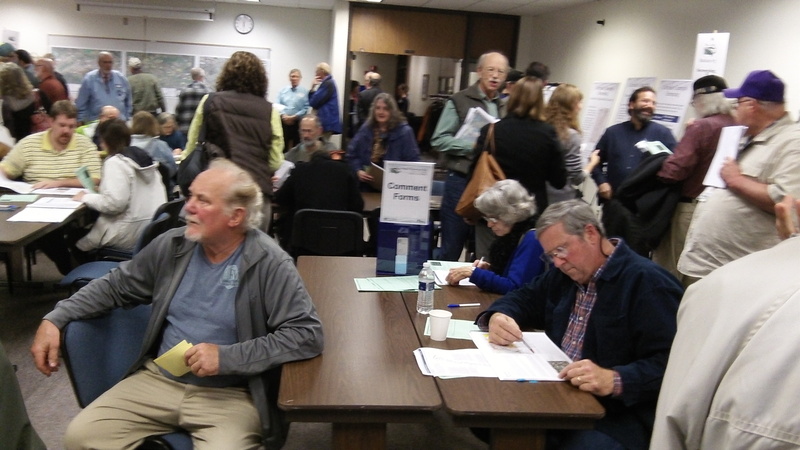 Thursday’s open house at LBCC for the Oregon Passenger Rail Project. Planning for more and faster passenger rail service in the Willamette Valley, a process governed by the National Environmental Policy Act, is going much slower than hoped for when it started. It’s like turtles planning a route for hares. 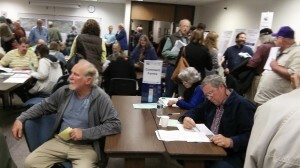 Slow or not, there’s plenty of interest in the work, as Thursday’s open house in Albany showed. It was intended as a way for the public to express itself on various likely alternative routes, and a crowd showed up. A leadership council of elected officials — including Albany Mayor Sharon Konopa and state Rep. Sara Gelser of Corvallis — is supposed to recommend a smaller set of alternatives for more detailed study in December. The council was appointed in September 2011 to guide process budgeted to cost $10 million and then expected to take two years. So it should be finished. But now, the study team does not expect to issue a final environmental impact statement until 2016. A final decision on the route, expected in mid-2016, then will launch a new round of environmental studies before construction can begin — assuming there is money. Bill Kapaun, via email: If you look at the current schedules for AMTRAK from Eugene to Portland, 3 of the 8 routes are served by train and 5 by bus. 1 of these train routes is by the Coast Starlight which isn’t cost feasible for commuting or scheduling, since that route may be already reserved by “through” passengers. IF we want to use Greyhound, we have to take the LOOP bus to Corvallis. Let them do the same if they want to take AMTRAK. IF Corvallis “must” be served by AMTRAK, let them use an AMTRAK bus. A bus doesn’t require new tracks. I got stuck at a RR crossing yesterday and the commuter train from Eugene went by heading north. I could count the passengers on board easily on two hands. This is not the first time I’ve noticed this. I’m not saying we don’t need to look to the future, but the need is certainly not very great today. I believe the highest ranked route between Eugene and Wilsonville is the ‘red’ route that would go right up I-5.